Takeaway: Understanding your plants’ photosynthesis requirements and matching them to proper lighting affects taste and nutrition in your hydroponic garden. Here's how lighting and plant hormones can make or break a crop. Improving flavor in the veggies and fruits we grow is a continuing focus for virtually every grower. With hydroponic growing, more factors are controllable by the grower and therefore the opportunity to discover methods during the growing cycle that help to accomplish better flavor is available and sought after. There are many published articles discussing the regulation of crop nutrients to adjust and improve flavor and plant tissue chemical content. There are, however, other aspects that have major roles in taste and nutrition. Photosynthesis is a primary operation within a plant and is responsible for a major role in crop taste. The light that we provide our crop is the number-one driver in powering photosynthesis and is very worthy of our attention in this matter. Incandescent light bulbs using reflectors have traditionally been used to create artificially long days. This type of light does have a wide range of light spectrum but is generally low in blue light, which is at the higher end of the photosynthetically active radiation (PAR) light range. Blue light is important to plants in several different areas. Another drawback to incandescent is that it produces a high amount of heat energy. In a cold climate greenhouse, this heat can be beneficial, but it isn’t typically wanted in other situations. Compact fluorescent lights are more efficient in producing blue and red light spectra, but are not generally good at far red light, which is important for stimulating certain plants’ flowering. Tube-type fluorescent bulbs are physically large but do offer a variety of benefits for the grower to consider. High intensity discharge lamps (metal halide and high pressure sodium) are great for providing much higher levels of light to boost photosynthesis and growth. Boosting photosynthesis during key periods of the growth cycle can provide various other benefits beyond just extra growth (see below). Light emitting diode (LED) lighting devices are very energy efficient and can allow the provision of greatly increased light energy without the concurrent addition of higher ambient temperature. Light spectrum availability with LEDs is also easily adjustable. These lighting units can work very well with a system applying the benefits of photoperiodism. Beyond photosynthesis, lighting influences plant growth and related processes like seed germination and flowering by affecting various hormones within the plant. The duration of darkness is actually what will make the major impact as compared to the duration of light, but as these two are completely controllable in many hydroponic applications, they become interdependent. Many flowering plants or angiosperms use photoreceptor proteins (phytochrome and cryptochrome) to sense seasonal changes in the length of darkness. The change in these proteins is what signals the plant to flower and, hence, be more successful in its reproductive efforts. The changes in these proteins naturally have other collateral effects, many of which are desirable. “Photoperiod” is the term used to describe the percentage of a 24-hour day that a plant receives light. Specifically, it is light in the PAR spectrum, which is also the range from red to blue that is visible to the human eye. Chlorophyll absorbs red and blue light, while carotenes and xanthophylls absorb some of the green frequencies. Since most of the green light is reflected and not absorbed, we see that characteristic color most of the time. During autumn, chlorophyll is degraded within the plant and so the leaf colors we see will change. Some plants are “long-day plants,” others are “short-day plants,” and others are “day-neutral plants.” There are also “long-short-day plants” that bloom after a period of long days followed by short days. Knowing which type of plant you are growing becomes important in designing a successful light growth recipe for your crop. Photoperiodism describes the practice of using various photoperiod formulas to produce various desired aspects in a crop. The effect of a modified photoperiod is well-documented on plant flowering, but perhaps not so commonly understood is its effect on chemical production within the plant and hence the flavor from that plant’s edible parts. A very significant light parameter that is also used in creating a beneficial plant response is that of spectral irradiance or photon flux density (PFD). This is the light energy provided to a crop at various and specific wavelengths or frequencies. A plant’s response to a modified photoperiod will also vary greatly between different species. One crop will respond differently than another to adjustments in the dark periods and light periods. It is due to a plant’s unique response to photoperiod that we find certain plants thrive in various unique areas of the world while others do not. These plants that thrive have evolved to become acclimated to the particular photoperiod of that locale. So, the precise schedule needed to maximize your crop may be a bit more complex than you may think. Lighting algorithms can in many cases recreate these unique growing conditions. Here are a few examples for plants affected by various photoperiods. Long-day plants: cabbage, carrot, lettuce, onion, and spinach. 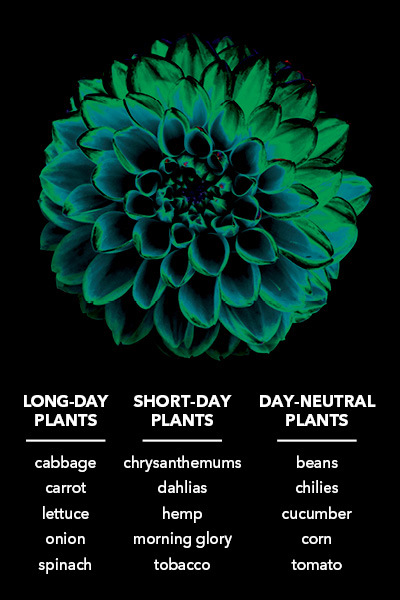 Short-day plants: chrysanthemums, dahlias, hemp, morning glory, and tobacco. Day-neutral plants: beans, chilies, cucumber, corn, and tomato. Just as flowering is affected by photoperiodism, other aspects of the plant are too. Light and dark periods affect the production of florigen within a plant, which in turn affects flowering. The protein flowering locus T is an important part of florigen, and this protein will affect the production of sugars and starch in a plant. These two components within a plant are vital towards the flavor and taste you get from your crop. Many of today’s hydroponic growers already use a form of photoperiodism for the lighting of their crop, often adjusting the photoperiod when they want their crop to change from veggie to bloom stage. In addition to this more commonly known technique and result, there are other options available to help growers get better results from their crops. Modifying the light and dark interval at various times and often for only a relatively short period of time can help to change key hormone production and result in a desired improvement. Modification of light intensity is significant and can be modified at specific times within the growth cycle to obtain differing effects. Modifying the light frequency or spectrum during key growth phases is another technique being studied with success today. These lighting recipes can be very useful to research and implement, and together with ambient temperature control are potentially powerful aspects of a lighting growth recipe that can be used to maximize your yield and optimize quality. Light-related aspects of plant growth strategies are among the newest technologies being studied and utilized to achieve many of the taste and nutritional aspects of the food we grow.